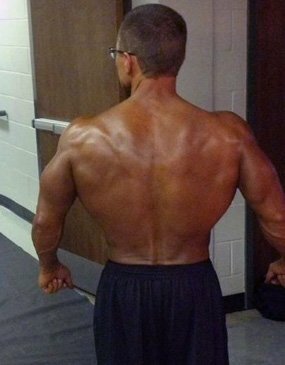 His college years were spent as a natural bodybuilder, but family and a near death experience put competitions on the back burner for decades. See how Bill found his way back to glory! I was always fit and athletic growing up. My primary sport was wrestling throughout high school and into college at Slippery Rock University. The problem was that I was always losing weight and was small. I wrestled at 112 pounds my senior year of high school. After my freshman year in college, I decided to start working out and put on weight. 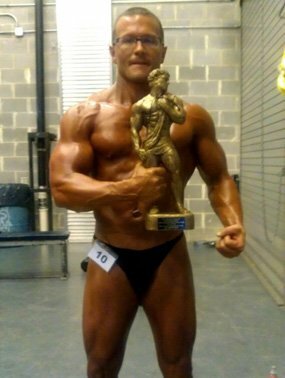 In two years I was doing competitive natural bodybuilding and won several shows. Then I graduated, started a family, and stopped working out. A few years ago, I almost died due to atrial fibrillation and high blood pressure and was in the hospital for a week. They prescribed all kinds of medications, but I decided to start working out again, eat right, and taking natural supplements instead. I continued working out periodically and eating right, but had no set goals, so I stayed heavy but put on muscle mass. When I turned 43 in May of 2011, I decided to compete naturally again. I set a goal to win and receive my pro card in the masters division of the SNBF Southern Open on July 21, 2012. I start my competition prep and diet on New Year's Day, which gave me 28 weeks to until show time. I weighed in on New Year's at 198 pounds and 19 percent body fat. To get shredded and meet my goal of five percent body fat by competition time, I needed to lose one and a half pounds per week and weigh in at 156 pounds. I hit my goal exactly and weighed in at 156 pounds on July 21, 2012 and took first place in the Masters Division of the SNBF Southern Open and received my pro card by sticking to my diet, supplementation, and workout plan. I never deviated from my plan or lost sight of my ultimate goal. 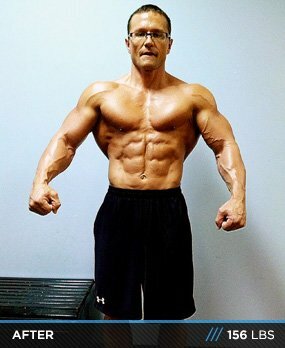 I read hundreds of articles on Bodybuilding.com, most of them by Layne Norton, and took what I felt were the best parts of each from the diet, supplementation, and workout. I combined them into my own personal program that I followed for seven months. I never took my eye of the ultimate prize and even had the date on my screensaver to look at every day for motivation. I researched every single supplement that I thought would help and read every review on Bodybuilding.com. I looked at body types of other people and compared them with mine. Then I narrowed it down to what I felt was the best products for me to take naturally with no caffeine (I'm unable to take anything with caffeine because of my heart). That made cutting fat even more difficult for me. I stuck to exact times of the day to eat each meal, workout, and to go to bed. I cooked my own food and worked out twice a day. I used a daily journal to keep track of everything I ate and my workouts. I received bodybuilding training and advice from a local expert and trainer who guided me, helped with my posing and routines, and administered weekly deep tissue massages and stretches that were key to my recovery and growth. Lastly, I had tremendous support from my family and friends and the assurance of Philippians 4:13 - "I can do all things through Christ who strengthens me!" This is where I probably differ with many within the Bodybuilding community. However, if you're a lifelong natural, you must supplement your diet with products that are proven to have benefits. I got most of my supplements and did most of my research on those supplements through Bodybuilding.com. Overview: Very Simple. Less than 50 grams of carbs per day, and 0 complex carbs, except for two re-feed meals on Thursday morning and Sunday night that contain 100 grams of protein and 300 grams of carbs. Other than the re-feed meals, the diet was the same seven days a week. I'll snack three times a day as needed with peanuts, macadamia nuts, or almonds (4oz per serving). Overview: Very simple and easy to follow: three days on and one day off with 30 minutes of cardio, abs, and calves every morning at 6:30 a.m. Morning cardio on an empty stomach. It was key, though, as I've tried other routines in the past and nothing worked like two-a-days with morning cardio on BCAA's and glutamine only. I want to put on five pounds of lean muscle this off-season, compete in 2013 as a pro, and win my first pro competition at the SNBF Championships in Atlanta, Georgia. Set a goal. My goal was to compete. Yours can be anything, but keep it plain, simple, and set a goal with an exact date to achieve that goal. Don't deviate from the program you set. Once you start down the slippery slope of cheating, it's much harder to climb back up. Bodybuilding.com provided me with a gateway to track and monitor my goals and achievements through BodySpace. This was huge to keep me true to my program. The support of many friends and community members kept me going along the way. The many great articles and guides allowed me to take bits and pieces of other successful competitors and tailor them to my body and needs. Lastly, the Bodybuilding.com Store made it much easier for me to order everything I needed and have it delivered to my doorstep. It's definitely a one stop shop for me.